Accurate and consistent lubricant / water mixing. Given the nature of the harsh conditions and jobs common to foundries, forge shops, steel mills, and many automotive plants, safety is a major issue in die casting operations. Robots are used to avoid humans from being exposed heat, harsh chemicals, high-pressure sprays and emissions. 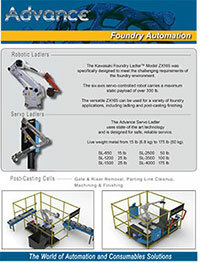 Industrial Innovations - Advance Automation foundry robotics can perform a variety of applications, including die-casting, gravity-casting, sand-casting, finishing, water or chemical cleaning, and forging. Our automated solutions can be used to lubricate dies, pour the metal into the chamber, extract the part from the mold, etc. Advance Automation offers turnkey automation system design, fabrication and installation with your choice of new or remanufactured robots. These solutions include all die cast peripherals such as ladlers, shot monitors, extractors, conveyors, trim presses, spray reciprocators, etc. We also provide post-casting cell support with gate and riser removal, parting line cleanup, machining and finishing, as well as spare parts and ﬁeld service support with 24 hour parts and service hot line. Our extractor design achieves optimum linear repeatability of .008 inch (.2 mm). It features two linear and one rotary axis conﬁguration with the availability of a fourth and ﬁfth servo wrist axis. Each axis is powered by its own AC motor and monitored by its own servo feedback device. Our automated, inline Die Casting Cooler utilizes a unique method of casting cooling using ambient shop air to reduce aluminum casting temperatures by up to 75% in less than five minutes. This eliminates the need for a water tank or refrigeration. Contact us to learn more. 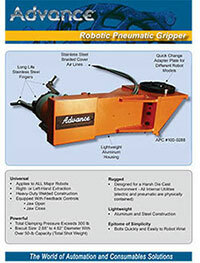 Our robotic pneumatic gripper is designed to work with all major robots offering right- or left-hand extraction.